In Part 2. we’ve created my version of the Bean Curd Appetizer. So, was it successful as a dish? Let’s look at the image below from the original dish. This dish is a simple dish with only two ingredients. Salted bean curd and cilantro. The cilantro was chopped in larger chunks. I’ve revised this dish by adding some green onions, some bean sprouts & Takana pickles (高菜漬）for textures, minced the cilantro, and added some hot chili pepper to the sauce. Comparing these two which dish reins supreme? Guess! And the Winner is …………………………The Original Dish! (I think so). When you combine too many elements you lose the sense of what is essential and the core. It’s like a sad sushi roll. What I mean by a sad sushi roll is a sushi roll with amazing ingredients fresh fish, fruits, veggies, great sauce superb quality but when brought together, it just doesn’t work because too many things are happening at once. If you have an amazing fresh fluke you want to focus on the fluke and not focus on five other ingredients simultaneously and on strong flavored sauce that kills the natural flavor of the fluke. Even if each of the ingredients have great flavors, when brought together, with too many other ingredients and flavors, they cross out each of their qualities rather than compliment each other. You need to be wise about the combination and bring in elements that would bring out the flavor of one another rather than compete and hinder the full experience. Sorry to say, most of those so-called special sushi rolls you find in many of the recent restaurants fall under this “sad sushi roll” category. The essence of Japanese cooking, I believe to be, is to focus on the ingredients to bring out the best of their natural flavors. This could be applied to any other dishes/cuisines as well. In this case, the original version had already achieved this goal where my version was a “sad bean curd” dish, too many things happening at once that resulted in ruining the dish. Cilantro’s flavor became too strong and overpowering because it was minced. More flavors and juices came out from cilantro. The large chunks of cilantro was a bit hard to eat in the original dish but because it was not minced and the flavor was more self-contained, the balance of the flavor in the entire dish was better. I would suggest rubbing it with some salt a bit and wash the salt off to slightly soften the textures. 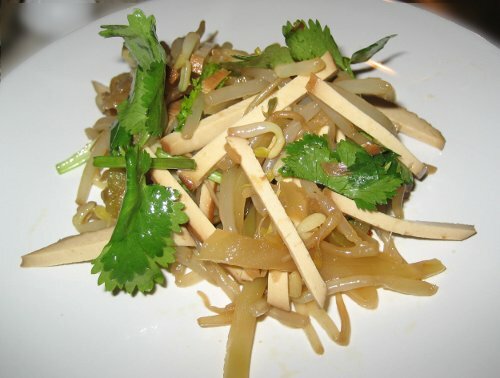 Bean sprouts worked very well in this dish. The crunchy texture brought more depth to the dish. Adding bean sprouts is highly recommended. Green onions tasted nice but with both minced cilantro and green onions combined it became too much for this dish (usually, this combination works well but not in this case). I prefer using either or, just use the green onions or the cilantro. Including Takana pickles (高菜漬）was not a bad idea but its flavor competed with the minced cilantro. If you were to use Takana pickles (高菜漬), I’ll go with green onions in stead of the cilantro. I think that would be a cleaner flavor. Also texture of Takana pickles (高菜漬) didn’t really go well with textures of other ingredients. Takana pickles (高菜漬) which is so similar to Suan cai (酸菜) does go very well with the salted bean curd and edamame beans. I think Preserved Chinese Radish (四川搾菜), which was my initial option, might be a better ingredients for this dish. 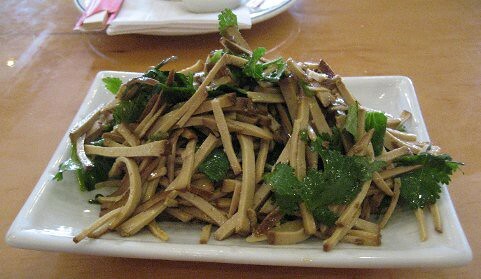 With Preserved Chinese Radish (四川搾菜), large chunks of cilantro would work better than green onions or minced cilantro. 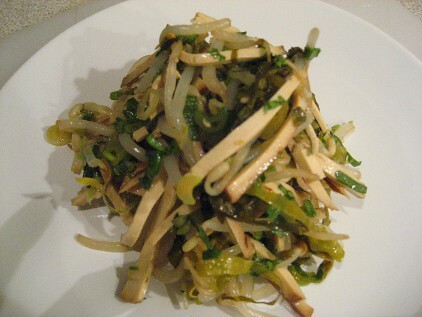 Also the texture of Preserved Chinese Radish (四川搾菜) would match better with the salted bean cured and the bean sprouts mix than the Takana pickles (高菜漬). I tasted the sauce before I made my own diversion, adding some red hot chili peppers. The flavor was simple and good but it tasted like Japanese-Chinese food. We have tons of these Japanese-Chinese dishes in Japan. These are Japanese interpretations of Chinese dishes with Japanese ingredients. They are tasty, sometimes made with great techniques, well thought out, and are almost there but not quite authentic. You can still taste and feel the Japanese-ness somewhere and the thought process involved in this cooking is very Japanese. Very similar to learning a foreign language or understanding another culture, I think , you need to be aware of the differences in the cognitive process to understand the cuisine. In some rare occasions, I can achieve “I can fake it for a Chinese” dishes – dishes that are made following the authentic Chinese cooking procedures and taste very authentic – owing to my Chinese cooking gurus (Chinese friends and Taiwanese brother-in-law who taught me their way of cooking and thinking ). For this one, I knew something was missing. I think the main and the obvious reasons why it didn’t taste authentic was because of the soy sauce flavor (other than the fact that the chef, me, was Japanese). I was using a mass produced Japanese soy sauce. I would like to revisit this issue once I discover the appropriate Chinese soy sauce for this dish. I would recommend adding the hot red chili pepper to this sauce especially, when you don’t have the Chinese soy sauce. Another thing I speculate about the flavor being a bit off was that when the woman shared her sauce recipe, she just provided three ingredients described above without any specific quantities. There is a slight chance that she overlooked some ingredients because it was too obvious and normal to her. Therefore she didn’t feel the need to communicate. When I tasted the sauce, I recalled that the original version had some sort of an aroma in addition to these three ingredients. I have been trying to figure this out but haven’t been able to pin point exactly what it is. It smelled slightly like a star anise but was not as strong. Just a hint of something was there to suggest that some Chinese herbs or some aromatic ingredients were included – perhaps the bean curd was slightly flavored (but not smoked). I’ve revised my recipe based on my findings. This is the refined version of the recipe. Excluded green onions, replaced Takana pickles (高菜漬) with Preserved Chinese Radish (四川搾菜), and chopped cilantro into larger pieces. Kept following ingredients as is: salted bean curd, bean sprouts, and the sauce. This turned out to be much nicer than the first version. It has a better balance of flavors that blends and compliments well. I still have to explore the soy sauce issues to see whether some of my hypotheses are true. It’s interesting how you think you have a well versed understandings of flavors and ingredients, combine them in your mind with confidence, then your confidence could be easily defeated in the physical world. You come up with ideas about recipes and get very excited. Still, you never know whether they work until you actually put them together and sample them. I wonder how many versions of recipes would a chef try out until she/he comes up the final version. I’m sure it depends on the individual and the dish. My first inception of this dish was absolutely stunning in my mind but my reality, my taste buds, told me otherwise. Like in any other case where you are faced with the dilemmas between your ideal and your reality, you just have to accept the situation, identify the issues, and come up with some sort of solutions – often creative ones. My journey (obsession) continues. **Detailed refined recipe coming soon. This entry was posted in Food, Recipe/Cooking and tagged Chinese, Cooking, Food, Recipe. Bookmark the permalink.